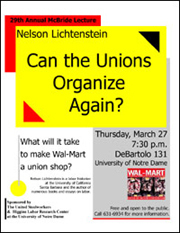 Nelson Lichtenstein, a pre-eminent historian of American labor from the University of California, Santa Barbara (UCSB), will deliver a lecture titled “Can the Unions Organize Again? What Will it Take to Make Wal-Mart a Union Shop?” at 7:30p.m. March 27 (Thursday) in 131 DeBartolo Hall at the University of Notre Dame. Sponsored by Notre Dame’s Higgins Labor Research Center as part of the McBride Lecture series, the talk is free and open to the public. A professor of history, Lichtenstein specializes in 20th century U.S. labor history and directs the Center for the Study of Work, Labor and Democracy at UCSB. He is the editor of “Wal-Mart: The Face of Twenty-First-Century Capitalism” and currently is working on a history of the world’s largest corporation, explaining how transformations in the technology and structure of the retail sector have enabled big merchants to assume a commanding role in the production as well as the distribution of the world’s goods. The McBride Lecture evolved from a lecture series established by the United Steelworkers of America in 1977 “to better understand the principles of unionism and our economy.” Beginning in 1997, the lecture was named to honor Lloyd McBride, the fourth international president of the United Steelworkers. Originally published by Shannon Chapla at newsinfo.nd.edu on March 19, 2008. Originally published by Arts and Letters at al.nd.edu on March 18, 2008.